Having loved Cal Newport's earlier books - Deep work and So good they can't ignore you, I was awaiting the release of his latest book, which is based on a topic of interest to me - Digital Minimalism. It was such an amazing read and certainly life-changing in many ways. Absolutely well written, thought-provoking and so relevant for our generation who lead a connected life 24*7. I had already shared my personal views on why I'm embracing digital minimalism. Will continue to share more on the practices I'm putting in place going forward. Coming back to the book, in Part I, Cal Newport in his typical style sets the context so beautifully on why our current relationship with technology is unsustainable. He highlights many reasons on how certain platforms are exploiting our psychological vulnerabilities, leading to behavioral addictions. He has also expanded on this context with relevant examples and case studies from the past 2 decades - the entry of iPhone, the rise of FB and other social media platforms and the widespread adoption of smartphones. Some of the comparisons he brought out are so powerful - smartphone resembling a slot machine where we keep trying our luck to see what we get, checking for "likes" is equivalent to addiction etc. The chapter on how tech companies encourage behavioral addictions was brilliant, where he talks about intermittent positive reinforcement and the drive for social appeal (Pages 17-24). I'm sure all of us who are active on social media will be able to relate to these reasons. Many of us have tried various tips and tricks under the sleeve to control our social media use or smartphone use in general. But Cal emphasizes the importance of identifying our "philosophy of technology use". He had also written about the same in Deep Work. As a first step, he proposes going on a 30-day digital declutter, where he suggests that we take a break from optional technologies in our lives and engage in activities that are meaningful and satisfying. After the 30-day period, we reintroduce the optional technologies slowly, based on how it adds value to our goals. In Part II of the book, he explains certain practices that are so important in leading a meaningful life outside our smartphones. The first practice he recommends was to embrace solitude and spend time alone with our thoughts. This is one of my favorite chapters, mainly because of the fact that our generation hasn't valued the importance of solitude. We check our smartphone or engage ourselves in some activity or the other "as a knee jerk response to boredom". The second practice on "conversations vs connections" is also extremely crucial for us. We tend to believe that we can replace real conversations (in-person or call) with casual texts/likes/comments etc through social media or texting apps. But Cal reiterates that humans are wired to be social BUT not through social media. This book doesn't advocate abstinence from social media or anti-technology; rather the author emphasizes on adopting technology with intention and using social media as a support/enabler for actual conversations. "The human brain has evolved to process the flood of information generated by face-to-face interactions. To replace this rich flow with a single bit (in reference to LIKE) is the ultimate insult to our social processing machinery. To say it's like driving a Ferrari under the speed limit is an understatement; the better simile is towing a Ferrari behind a mule." Finally, Cal recommends the importance of high-quality leisure in our day-to-day routines. This chapter talks about identifying our offline leisure activities - craft where we use our own hands to create something valuable. I'm currently reading Cal Newport's Digital Minimalism. Halfway through the book, I'm just blown away - too many "aha" moments, evoking so many emotions as I'm nodding my head and underlining powerful lines in every single page. Will do a detailed review once I finish reading the book. As I was reading, many thoughts came gushing from the top of my mind on why digital minimalism is important to me. Cal Newport's earlier book "Deep work" had made such a huge impact on me when I read it in 2017. Since then, I have taken multiple breaks from social media and I have also realized that I'm not as addicted as I thought to be. One of the powerful takeaways for me was to set an intention for every technology we use - why am I using it? How is it aligned to my goals? Since then, I realized my goals for using social media were related to spreading awareness about healthy eating, food and nutrition and also share my perspectives on topics that are important to me - productivity, parenting, writing, learning etc. I stopped posting personal updates on social media - vacation pictures, important events like birthday/anniversary, funny memes, forwards etc. I uninstalled FB and Twitter apps from my phone and access these accounts only when I'm in front of my laptop. My time spent in these two social media platforms had come down a lot in the past two years. But I had also started to spend a lot more time on Instagram around the same time. I was convincing myself that I have found like-minded people and have made friends through this platform. Though the posts I was posting and the people whom I'm connecting with through this platform tie closely to my goals, it certainly doesn't justify the ridiculous amount of time I had been spending on it. I do take Insta breaks often by uninstalling the app from my phone for a few days. Surprisingly during such breaks, I don't feel fidgety or seem to miss it much. Let me admit, my 7-year old daughter D had told me a couple of times, "Why are you seeing your phone always? ", "Are you in love with your phone?". It felt like a tight slap and I knew I needed to do something to reduce my phone usage. I installed an app to measure my phone use timings and I learned that I use my phone 2-3 hours per day on an average. The main concern is that the phone use has been staggered throughout the day, which explains the 50-60 times screen unlocks per day. I do believe that deep, focused work is extremely important to get anything worthwhile accomplished. Whenever I'm working on my blog posts, I'm completely in FLOW - I can sit for 2-3 hours at a stretch without getting distracted and finish my posts. So I had to come up with ways to be in FLOW on activities that matter to me, apart from writing. When you seek something, a solution appears. I stumbled upon this app called Forest a few weeks back. You can set a timer whenever you are involved in something. During this time, you cannot use your phone. For each focused sitting, the app rewards you with a grown plant/tree (virtual of course!). If we check our phone while the tree is growing, it withers. What a great use of gamification! I decided to get D involved in this activity as well. We would sit together and read our books while the Forest app grows our plant during the time we are focused. She is super excited about this app and would pull me often during the day, "Come, let's use Forest app". Thanks to this app, I have been spending more time on reading these days. I also realized that whenever I'm traveling, I hardly use my phone, except for clicking pictures. I'm engrossed in observing new places and surroundings. But when I'm at home, I mindlessly check my phone whenever a tiny flash of boredom strikes. During our last vacation to Kerala a few days back, my husband and I were sitting in the balcony of our hotel room, admiring the beauty of nature all around and sipping chai one afternoon. I said to him, "It is so nice to sit here without our phones". He then asked me, "What did we used to do back in 2007-08 without our phones when we are on quiet vacation like this?". I replied, "We used to read a lot, go for walks or just sit idle". Such idle moments of nothing have become such a rarity these days. Another experience that made me feel bad about how times have changed was during the same Kerala trip. We were waiting in KR Puram railway station one evening. I was so excited to be at the train station that day as I was traveling by train after a long time - the sight of trains arriving and departing at different platforms, vendors shouting "chai, chai", book shops selling magazines etc. Watching the hustle and bustle in an Indian train station is just so exciting and makes me quite nostalgic. Growing up in the 80s, train travels have always been very special. But when I looked around that evening, it made me feel sad to see a sight like this - everyone on their phones, some watching youtube, reading WhatsApp forwards, one of them watching a movie on Amazon Prime, all eyes hooked to their smartphones. Addiction to phones/gadgets is quite similar to addiction to junk foods. Just like how junk foods are carefully designed with the right balance of sugar, salt, fats and other flavor enhancers which make them addictive, many apps that we use on our phones are carefully designed with the right reward mechanisms and continuous streams of validation that we seek because of our inherent psychological triggers. Going forward, I'll share my progress on how I'm embracing digital minimalism. It is certainly the need of the hour to claim back our TIME - the ONE resource that is given equally to all of us on the planet. "Meal replacement" is the new buzzword these days. Meal replacement smoothies, meal replacement shakes, meal replacement soups etc. Breakfast bars and snack bars fall under this category too. The front side of the pack has all the right words to grab the attention of today's health conscious, time starved consumers. But turn to the ingredients list and you'll know the real facts. As you can see, various avatars of sugar are present - corn syrup, invert syrup, fructose etc. Each bar contains 11.4 gm of sugar (close to 3 tsp of sugar). The percentages of healthy ingredients like rolled oats, almonds, cashews, raisins, cranberries, flaxseeds etc are not mentioned. So I presume they are quite low. 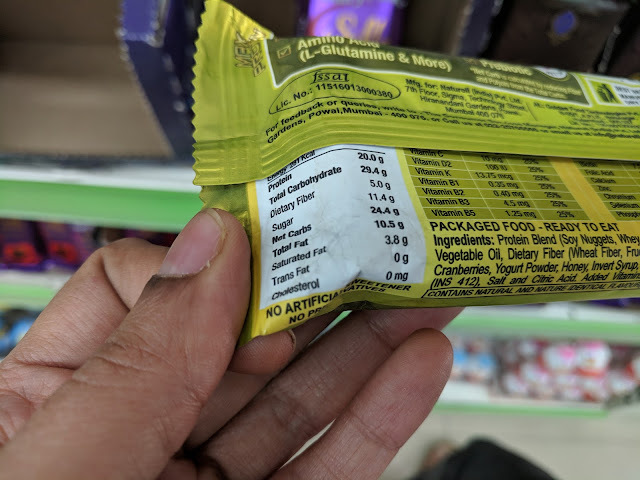 A pack containing ONE breakfast bar costs a whopping Rs.120. For the same price, we could easily buy more than a handful of nuts and dry fruits. 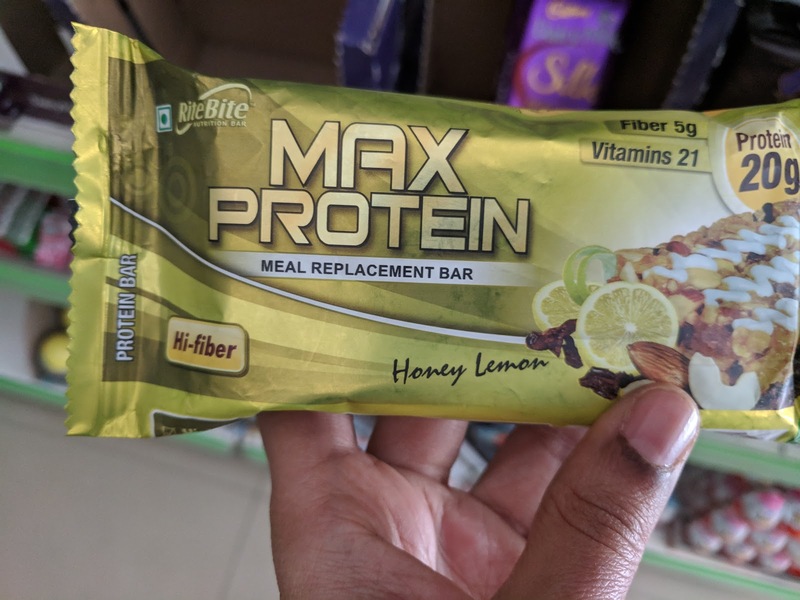 Why eat a breakfast bar with unhealthy ingredients having a 9-month shelf life when you can eat a handful of nuts and dry fruits that are natural, containing proteins and healthy fats for the same price? Emulsifying agents - INS 322 (Soy Lecithins) and INS 471 (mono- and diglycerides of fatty acids (glycerol monostearate, glycerol distearate)) are being used. Soy lecithin being extracted from soy has a higher chance of being genetically modified. Last but not the least, the source of protein is both from soy and dairy. These are my personal thoughts on these two ingredients. First let's focus on soy. More than 93% of soy planted in the United States is genetically modified. In India, only cotton is genetically modified as of now. Unless brands explicitly confirm that soy used is non-GMO or they mention that the source country of soy is India, I'm extremely skeptical of consuming soy products. As I had written in my earlier post, these are my thoughts on using dairy as a protein source. When milk is processed to form cheese, the remaining liquid is called whey. This liquid undergoes several processing steps and then dried to form a whey protein concentrate powder. Given that most commercial milk is adulterated and the cows raised in large-scale dairy farms are given antibiotics, growth hormones and what not, I don't consider "dairy products" procured from a commercial large-scale industry as a reliable nutrition source for protein (or calcium). I would urge all these protein supplement brands (that use whey protein isolate/concentrate as their protein source) to first prove that their supplements are free from antibiotics/growth hormones residues. Even if you don't agree with me on the last point, I hope you would make a note of the sugar levels in such meal replacement bars that promise high protein. I believe we can get enough protein from plant-based sources, following a typical Indian balanced diet. I had compiled a list of plant-based protein sources, along with their protein values. Please do take a look. If you still believe dairy to be the uber source of protein (and calcium), try to get organic milk that is free of antibiotics/growth hormones from a local dairy farm - the kind of milk that our grandparents used to procure. Things happen for a reason - I'm starting to believe this idea more and more these days. The people you meet on a random day can bring in new ideas or change of perspectives. This incident narrated below happened last October. I was traveling in a BMTC bus with my daughter D. An elderly lady was sitting next to us. She was reading a magazine titled "Heartfulness" and I was peeping to see what it was all about. Let me admit, I have this uncontrollable urge to find out what book/magazine someone is reading while at a public place (Anyone else does this?). Then she started talking and was telling me about a form of meditation and a book that has been translated into multiple languages. She also told me that there is a discount going on in Amazon for this book if I'm interested. As she was getting down at her stop, she turned to me and said, "We were meant to meet and I'm happy to have introduced this concept of meditation to you". She didn't try to persuade me to buy this book. The conversation didn't sound sales-y. It felt genuine and I could sense a calmness around her. After we reached home that evening, I checked in Amazon and bought this book at a discounted price. The book arrived a few days later but I didn't start reading it immediately. It was happily lying on my bookshelf for a few months. Last Thursday, as we were about to leave for our Kerala mini-vacation, I quickly grabbed this book without a second thought and dumped it in my handbag, hoping I could read a few pages during the travel times. Little did I know that I would get so hooked to it that I ended up finishing the book in 2 days. The book "The Heartfulness Way" talks about a 3-step process that lets us connect within and feel the divine source through meditation. The 3-step process prescribed maps to the 8 stages of Ashtanga Yoga and I really liked the explanation given for each of these stages. I'm not going to elaborate on this process but what worked for me in this book is that there were many lines and passages that felt like they were written for me personally. Some of the lines were so relatable, that I was literally nodding my head, taking a pause, looking at the beautiful scenery all around me and absorbing the message. "Everything starts with the heart. When the heart is at peace, the mind is at rest. When the heart is content, the mind gains insight, clarity and wisdom. We often think that the heart and mind are two distinct entitities that are often in conflict with one another. In heartfulness meditation, we use the heart to regulate the mind, thus bringing them both into alignment." "Meditation is not concentration. Concentration is forceful, while meditation is effortless, involving no force at all"
"Our thoughts, emotions and activities leave traces in the atmosphere. When entering any place, we resonate with what we feel there"
"If you spend your money wisely, then why would you need so much of it? When you truly value a resource, you want to make the very most of it. You conserve it"
"Sight is the most prominent sense. We tend to focus upon whatever we see, so closing the gate of sight helps us reorient our awareness inward"
"The greater a thought's emotional intensity, the stronger its subconscious influence"
"As we become more receptive to the voice of the conscience, we find that it holds us accountable for smaller and smaller matters. Even at the subtlest hint of a wrong thought, we find that the conscience pricks." In today's world, we are reacting to each and every external stimulus. This has taken us so far away from realizing the divine source within. This book prescribes a spiritual process to look inward, that not only helps us to dive deep into our inner consciousness but also helps us to tackle the challenges of the external world. I loved reading it and am planning to incorporate the meditation process in my routine. Frugal living is a concept that I grew up with. It offers various benefits - to our pockets, our mental well-being and peace and of course, to our environment. Before I talk about ways to reduce expenses, let me share my views on why we should reduce consumption. The less we buy/own, the less time we spend in managing them, organizing them, the less money we spend in buying organizers to manage them, the less energy we spend in maintaining them. This applies to all categories of purchases we make. The bottom line is - The fewer expenses we have, the less complicated our lifestyle becomes. A few weeks back, I had attended a personal finance workshop, where the financial advisors spoke about increasing your income potential and increasing your investments. But none of them spoke about reducing expenses. In fact, some of them go on record and say, "Don't think about expenses. Don't calculate how much you are spending". I completely disagree with such viewpoints. When these financial advisors talk about retirement corpus, the key input factor is your "monthly expenses", which is then extrapolated based on inflation to compute the corpus required. If the monthly expenses are less, then the retirement corpus required would obviously be less. Yes, income and investments are important to think about, but it is also equally important to think about expenses. A penny saved is worth a penny earned. In this article, my focus is on food-related expenses. Here are 10 ways by which we can reduce expenses by embracing healthy eating habits for life. Duh, what else will be my first point? ;-) A decade ago, my family's weekly shopping cart used to be loaded with muesli, instant oats, act II popcorn, lays chips, cookies, biscuits, packaged tetra pack juices etc. 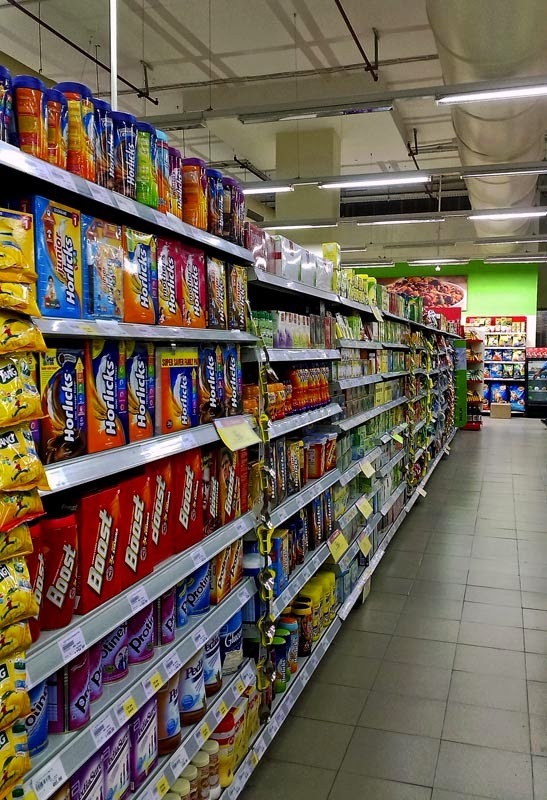 Over the past 5 years, we have stopped buying packaged foods completely. They give an illusion of convenience but they add up to our expenses quite a lot. Breakfast cereals alone will cause a significant dent to your monthly grocery bills. There are additional costs linked to their consumption - healthcare costs that you'd eventually be spending on because of health issues. There is a cost to the environment as well, thanks to the huge amounts of plastic that we dispose off, after eating packets of junk. This is a topic that is extremely important to me. Many of us bring home loads of vegetables and fruits during our weekly grocery shopping and dump them into our fridge. During the busy weekdays, we hardly keep track of what's in there, which eventually ends up rotting and we had to throw them out. 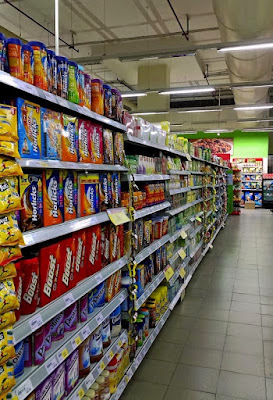 Similarly, we buy provisions/dry groceries in bulk and don't keep track of the half-opened/not-yet-opened packs, which also results in duplicate purchases and wastage. Over the past few years, I have put in place several processes at home that helps me to prevent food wastage. Whenever I go shopping, I prepare a list beforehand and avoid impulse purchases. I ensure I keep myself aware of the dry groceries and fresh produce so that I don't end up stocking the same thing twice. Shared a few ideas in this blog post. Making a list of veggies and striking them down after use has now become an ingrained habit. Wrote about it in detail in this blog post. 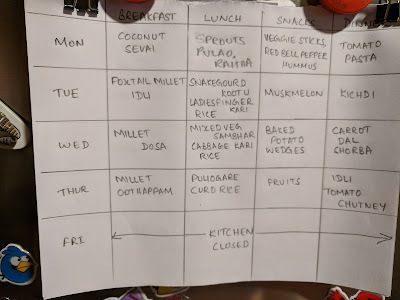 I wrote a post on meal prep and planning a couple of years back, where I had mentioned that weekly meal planning is a tedious process. How wrong was I! It has made my weekdays so much easier. For the past three months, I have been doing weekly meal planning that has really helped me to plan and use up groceries and veggies based on the purchase date. Because of the plan, I know exactly what to cook, there is no wastage and my grocery expenses have also reduced considerably. Will do a separate post on how meal planning has helped me in detail. Convenience products cost quite a bit. For eg, roasted flaxseeds cost almost double than raw flaxseeds. Spice powders are expensive when brought from the store but they cost very little when made at home. I make most of the spice powders, batters, pickles etc. I prepare and stock up coriander powder, pepper powder, jeera powder, chai masala, sambhar powder, rasam powder, idli chutney podi etc for a month. The costs of buying such packs are quite high, compared to the tiny amounts of time spent in making them. Moreover, we are aware of the ingredients used. A few more ideas shared in this post. As a family, we have set a monthly budget for eating out in restaurants and we try to stick to this limit. Keeping track of our expenses helps us to know our cash flows better. So if we are already nearing the limit towards the end of the month, we stick to eating homecooked food. This is in continuation to point #5. Identify what eating out means to you. Is it convenience, change of routine, social gathering, exploring different cuisines? Since I cook all meals at home, I would prefer to take a break 1-2 meals a week, which is usually lunch on a Saturday/Sunday. We go out to run errands or plan a casual family outing. We decide on the restaurant to visit in the locality where we are headed. This way, we eat all our meals at home on weekdays and go out during weekend afternoons. We rarely order from Swiggy/Zomato etc. We would rather eat dosa with molagapodi at home on busy days than order food that comes packed in cheap, plastic containers. Both my husband and I love our tea and filter coffee. We don't like to have them at expensive cafes. I'd rather have a small tumbler of filter coffee at a Darshini/Sagar/A2B than a cream-loaded latte at CCD or Starbucks (seriously overhyped, not my kinda coffee). Why do we need such large "mugs" of coffee, I wonder? It is really sad to see the line up of imported fruits and veggies on supermarket shelves. They are so damn expensive and on top of that, there are hardly any nutrients left, because of high food miles and chemicals being sprayed to extend their shelf lives. I'm a big believer of eating local fruits and vegetables. Since they are grown locally, the prices of such items are lower as compared to imported veggies like zucchini, kale, baby spinach, Washington apples, California grapes etc. For eg, 1 kg of violet brinjals cost around Rs.50 (Bigbasket) and 1 kg of cowpea beans cost around Rs.70. Compare that to broccoli (Rs.170 per kg), asparagus (Rs.372 per kg) and zucchini (Rs.110 per kg). Yes, they might be healthy but the question is do we need them when we have options that are equivalent or even superior in nutrition profile? Similar to fresh produce, I prefer to buy local grains and pulses - millets (that cost Rs.80-Rs.90 per kg) compared to quinoa (Rs.500 per kg). Elaborated more on this point in my article from 2015. Hope these points were helpful. Do share your thoughts on how you cut down on food-related expenses. Would love to hear your perspectives.